Anterior segment OCT (AS-OCT) was first described in 20011 and has been commercially available for more than a decade. 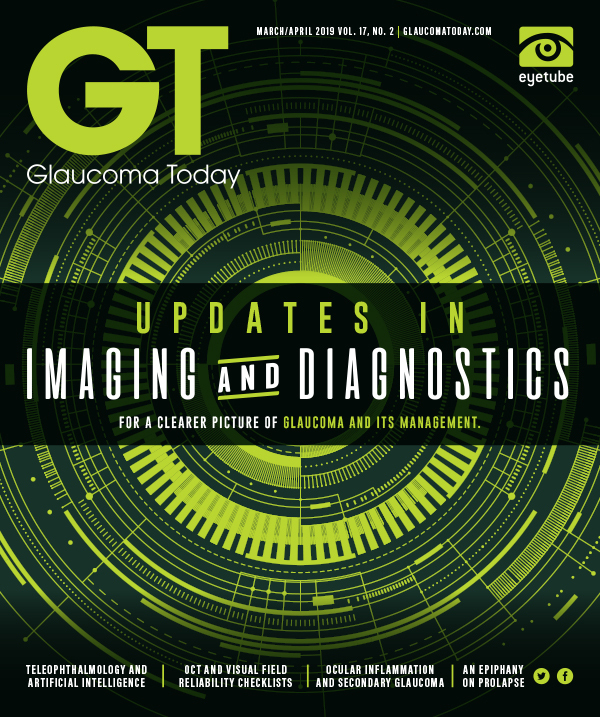 However, the technology has not achieved widespread adoption in clinical care, even among glaucoma specialists. There are several possible reasons for its underutilization. • AS-OCT can be a valuable tool for the identification and sequential evaluation of patients with various anterior segment pathologies. It is especially advantageous for evaluating degrees of narrow angles and angle closure. • The precision of AS-OCT can be truly exceptional if the images are acquired properly. The initial AS-OCT device that was introduced (Visante, Carl Zeiss Meditec) could be used only for anterior segment evaluation, and the wavelength for the scans (1,310 nm) was optimized for examination of the iridocorneal angle. Furthermore, the relatively high cost of the device along with the inability to receive insurance reimbursement for the procedure (at least in the United States) were likely factors affecting the low adoption rate. Additionally, despite the large number of research studies showing AS-OCT to have good reproducibility and repeatability,2-4 AS-OCT systems were meant to augment the standard gonioscopy technique rather than replace gonioscopy. Some glaucoma specialists maintain that there is no incentive to adopt AS-OCT because gonioscopy is quick and fairly easy to perform. Despite its recognized advantages, gonioscopy has inherent shortcomings, some of which may be significant hindrances to obtaining precise measurements. Gonioscopy takes hands-on training to learn and potentially years to master, requires contact with the patient’s eye, is subjective, and requires light for visualization, which may affect angle opening. Additionally, with gonioscopy, the operator may inadvertently open the angle by unintentional indentation. AS-OCT offers certain advantages compared with gonioscopy. It requires no contact with the eye, can be done in complete darkness or under standardized lighting conditions,5 and can be performed by a technician to be interpreted by the physician. Although AS-OCT cannot provide images analogous to indentation gonioscopy, taking scans with the lights on and off can offer an idea about the narrowing of the angle with lighting and the degree of pupillary constriction. Fortunately, the current generation of spectral-domain OCT (SD-OCT) devices widely used by clinicians to image the posterior segment can also acquire anterior segment images. Therefore, purchase of a separate dedicated OCT designed only for the anterior segment is no longer necessary. One of the most common indications for use of gonioscopy is to examine the iridocorneal angle for angle closure.9 Although gonioscopy is relatively quick and easy to perform, it does not offer an easy way to precisely document the degree of angle opening. Even the criteria for determining whether a patient needs a laser iridotomy for angle closure based on gonioscopy alone have not been well defined. A recent study reported that, using an algorithm based on pretreatment AS-OCT scans, the AS-OCT parameters were superior to glaucoma-trained ophthalmologists in predicting the success of laser peripheral iridotomy for primary angle-closure suspect (PACS) eyes.10 Thus, incorporating AS-OCT into the clinical setting certainly deserves a look. In clinical practice, one of the most useful aspects of AS-OCT is the ability to use the scans to teach patients about their ocular conditions, especially those with narrow angles or with primary angle closure (PAC), who are typically asymptomatic. 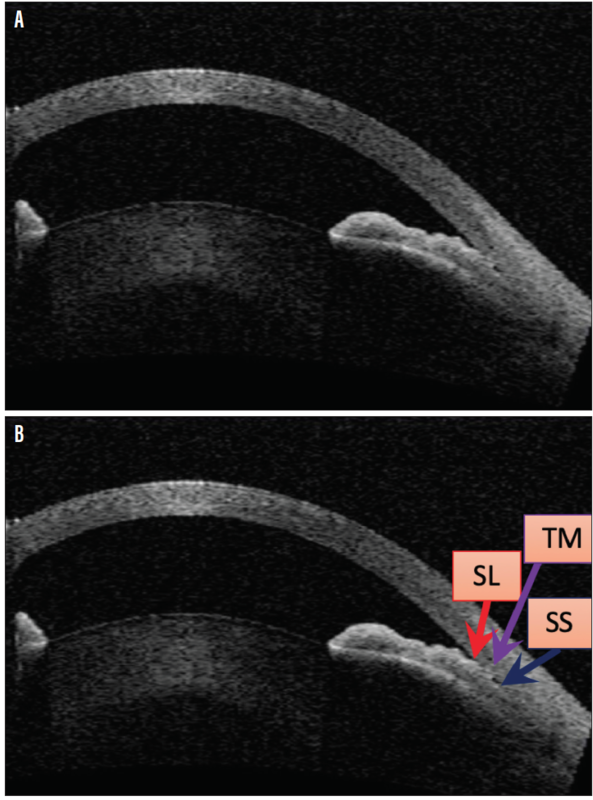 Figures 1 through 5 illustrate how precisely AS-OCT is able to capture cross-sectional images of the iridocorneal angle with standardized lighting conditions. In Figure 1, there is almost iridotrabecular contact, whereas in Figures 2, 3, and 4, definite iridotrabecular contact is seen. Figure 1. Anterior chamber angle with almost iridotrabecular contact. Imaged by the Cirrus HD-OCT (Carl Zeiss Meditec) in five-line raster imaging mode. Original image (A) and image labeled with anatomic landmarks (B). Abbreviations: Descemet’s, Descemet membrane of cornea; endothelium, endothelium of the cornea; SL, Schwalbe line; TM, trabecular meshwork. Figure 2. Anterior chamber angle with definite iridotrabecular contact. Imaged by the Cirrus HD-OCT in the five-line raster imaging mode. Original image (A) and image labeled with anatomic landmarks (B). Abbreviation: Descemet’s, Descemet membrane of cornea; endothelium, endothelium of the cornea; SL, Schwalbe line; TM, trabecular meshwork. Figure 3. Anterior chamber angle with definite iridotrabecular contact. Imaged by the Spectralis (Heidelberg Engineering) with an add-on anterior segment lens (Heidelberg Engineering). Original image (A) and image labeled with anatomic landmarks (B). Abbreviations: Descemet’s, Descemet membrane of cornea; endothelium, endothelium of the cornea; SL, Schwalbe line; TM, trabecular meshwork. Figure 4. Anterior chamber angle with definite iridotrabecular contact with associated anterior lens vault. Imaged by the Visante time-domain AS-OCT (Carl Zeiss Meditec). Original image (A) and image labeled with anatomic landmarks (B). Abbreviations: SL, Schwalbe line; TM, trabecular meshwork; SS, scleral spur. Based on the accepted definitions of PACS and PAC, the extent of iridotrabecular contact (less than or greater than 180°, respectively) is important to determine, and this can be addressed by acquiring multiple scans in different locations. With certain OCT devices, however, it is virtually impossible to acquire 360° images of the iridocorneal angle. Figure 5. Anterior chamber angle with peripheral anterior synechiae. Imaged by the Spectralis (Heidelberg Engineering) with an add-on anterior segment lens (Heidelberg Engineering). Original image (A) and image labeled with anatomic landmarks (B). Abbreviations: Descemet’s, Descemet membrane of cornea; endothelium, endothelium of the cornea; SL, Schwalbe line; TM, trabecular meshwork. In this case, the location of Schwalbe line is an estimate due to peripheral anterior synechiae. Figure 6. Anterior chamber angle with peripheral anterior synechiae. Imaged by the Cirrus HD-OCT in five-line raster imaging mode. Original image (A) and image labeled with anatomic landmarks (B). Abbreviations: Descemet’s, Descemet membrane of cornea; endothelium, endothelium of the cornea; TM, trabecular meshwork. It is not possible to determine the location of Schwalbe line due to the severe peripheral anterior synechiae. 1. Radhakrishnan S, Rollins AM, Roth JE, et al. 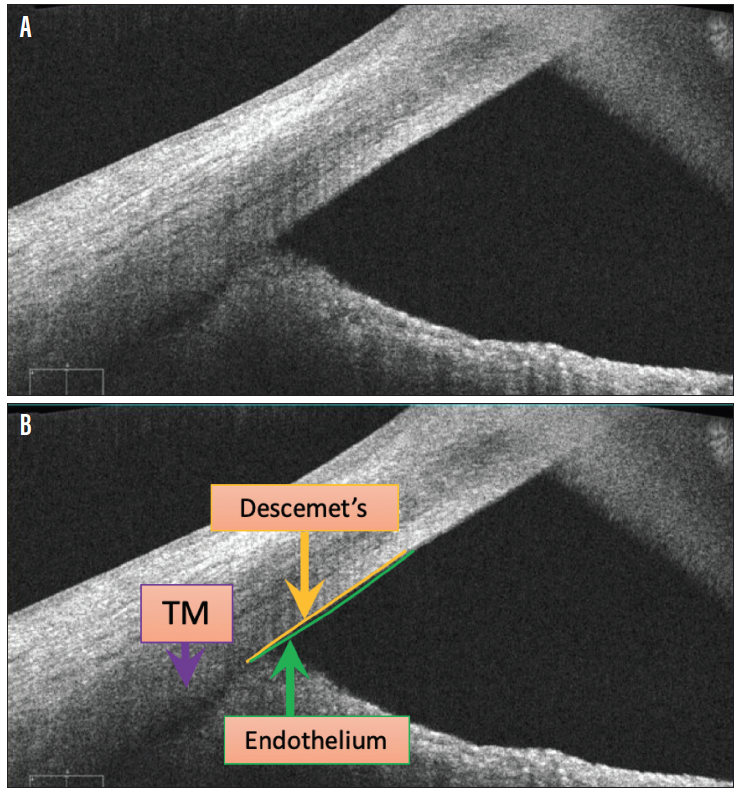 Real-time optical coherence tomography of the anterior segment at 1310 nm. Arch Ophthalmol. 2001;119(8):1179-1185. 2. Maram J, Pan X, Sadda S, et al. Reproducibility of angle metrics using the time-domain anterior segment optical coherence tomography: intra-observer and inter-observer variability. Curr Eye Res. 2015;40(5):496-500. 3. Marion KM, Maram J, Pan X, et al. Reproducibility and agreement between 2 spectral domain optical coherence tomography devices for anterior chamber angle measurements. J Glaucoma. 2015;24(9):642-646. 4. Pan X, Marion K, Maram J, et al. Reproducibility of anterior segment angle metrics measurements derived from Cirrus spectral domain optical coherence tomography. J Glaucoma. 2015;24(5):e47-51. 5. Marion KM, Niemeyer M, Francis B, et al. 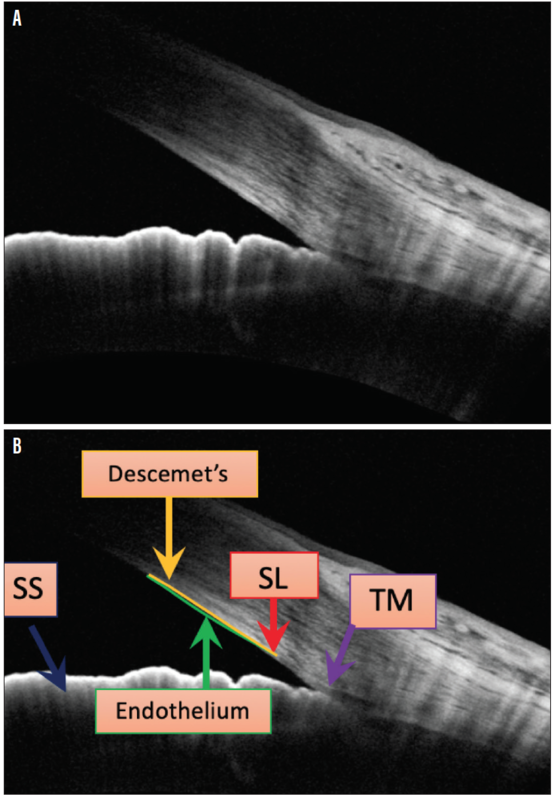 Effects of light variation on Schwalbe’s line-based anterior chamber angle metrics measured with Cirrus spectral domain optical coherence tomography. Clin Exp Ophthalmol. 2016;44(6):455-464. 6. Cheung CY, Zheng C, Ho CL, et al. Novel anterior-chamber angle measurements by high-definition optical coherence tomography using the Schwalbe line as the landmark. Br J Ophthalmol. 2011;95(7):955-959. 7. Qin B, Francis BA, Li Y, et al. Anterior chamber angle measurements using Schwalbe’s line with high-resolution Fourier-domain optical coherence tomography. J Glaucoma. 2013;22(9):684-688. 8. Crowell EL, Baker L, Chuang AZ, et al. 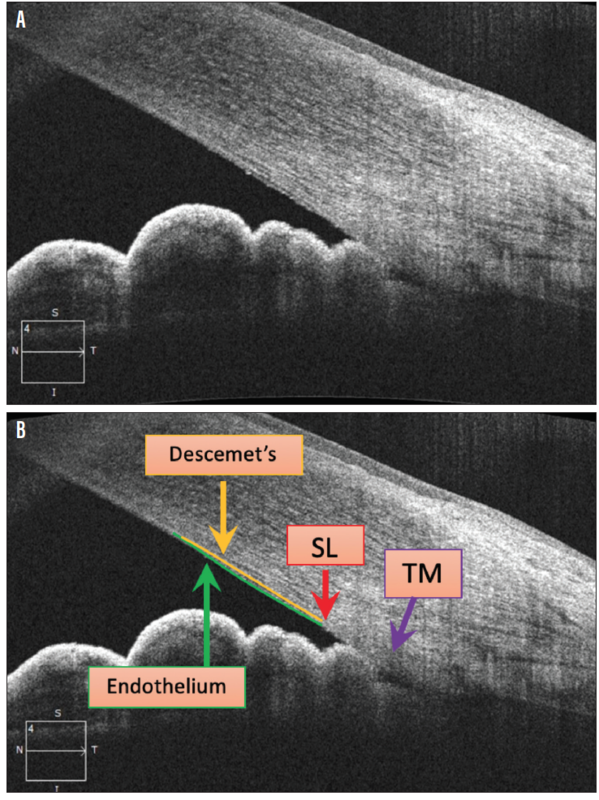 Characterizing anterior segment OCT angle landmarks of the trabecular meshwork complex. Ophthalmology. 2018;125(7):994-1002. 9. Sakata LM, Lavanya R, Friedman DS, et al. Comparison of gonioscopy and anterior segment ocular coherence tomography in detecting angle closure in different quadrants of the anterior chamber angle. Ophthalmology. 2008;115(5):769-774. 10. Koh V, Keshtkaran MR, Hernstadt D, et al. 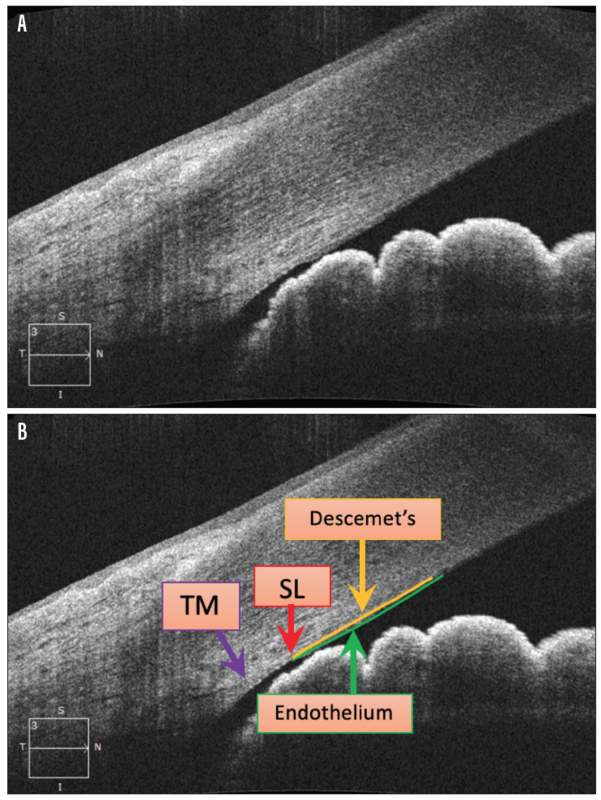 Predicting the outcome of laser peripheral iridotomy for primary angle closure suspect eyes using anterior segment optical coherence tomography. Acta Ophthalmol. 2019;97:e57-e63. 11. Aung T, Lim MC, Chan YH, et al. Configuration of the drainage angle, intraocular pressure, and optic disc cupping in subjects with chronic angle-closure glaucoma. Ophthalmology. 2005;112(1):28-32. 12. 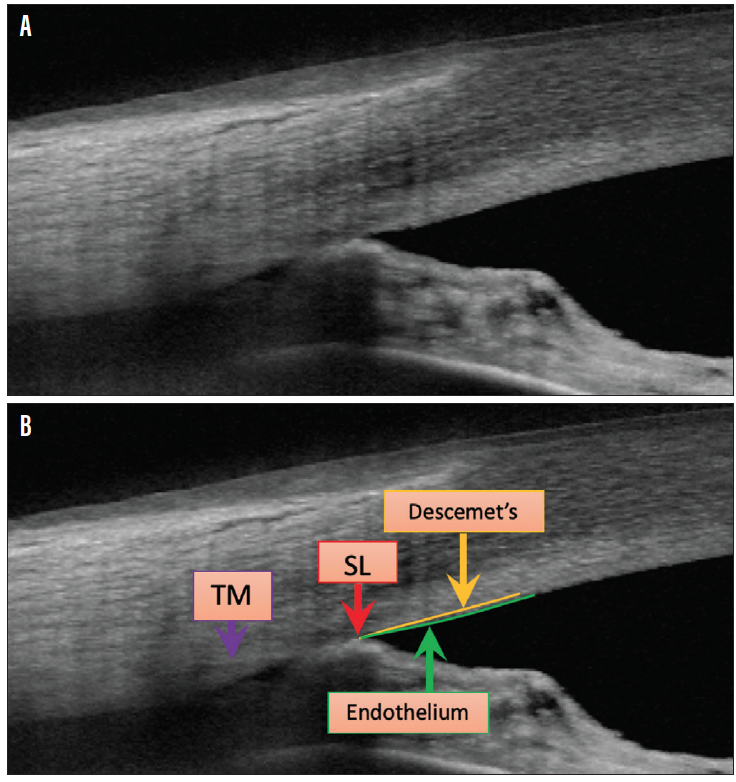 Chew PT, Aung T. Primary angle-closure glaucoma in Asia. J Glaucoma. 2001;10(5 Suppl 1):S7-8. 13. Foster PJ, Johnson GJ. Glaucoma in China: how big is the problem? Br J Ophthalmol. 2001;85(11):1277-1282.